Quotations, poetry, stories and songs that I find inspirational. From E.E. 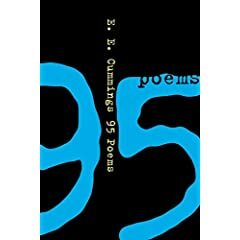 Cummings "95 Poems"
I had memorized this poem 40 years ago. Recently, I tried to recall it and some lines were missing from my mind. I have been unable to find a copy of it anywhere--not in any of the ee cummings books in the library, nor on line. It is such a joy to be able to recite the entire poem again. My favorite time to say it is in my front yard, on breezy summer day, under the 60 year old birch trees. the birch branches hang down like streamers, the clouds flit past high above. I can feel the ends of the branches gently brush my face. Sometimes, I feel a find a cold, wet nose obscuring my view, immediately followed by a sweet doggies kiss. I guess when on is lying on the grass. one is fair game for the pups! thank you. i shared this poem by heart with lois 26 years ago yesterday when i asked her to marry me, again during our wedding and for many many years thereafter on valentine's (engagement) day and our aug14 wedding anniversary day. she often writes let's touch the sky on cards to me and had it engraved on a gift last summer for our 25th anniversary. as an idealistic teen nearly 40 years ago, i came to love 95 poems, particularly the bookend opening and closing poems of autumn loneliness and spring hope.